Treasure, famous among action game fans for games like Gunstar Heroes and Radiant Silvergun, has made a shooter that throws out the one ship armory idea, and replaces it with a simple yet strategic gameplay mechanic that turns the tired shooter gameplay on its side. Ikaruga is like the jump from Super Mario Bros. to Super Mario World, or from Metroid to Super Metroid. This is the evolution of shooters. The story in a shooter is primarily a way to pit a lone fighter against an overwhelming enemy force, and Ikaruga doesn't break this mold. After unearthing a powerful object, the Horai empire has started to dominate the Earth. A rebel faction has tried to fight it off, but their forces have been obliterated by the Horai. 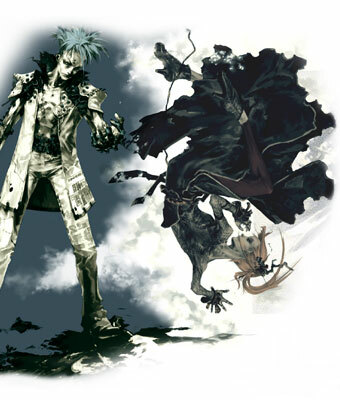 Shinra, the last warrior of this force crashes in the small village of Ikaruga. 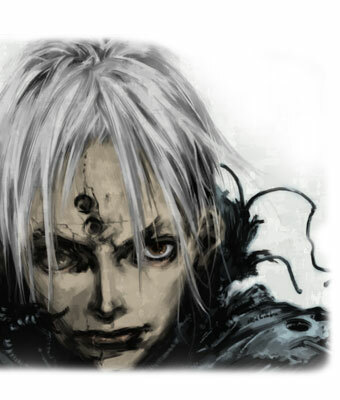 The locals, oppressed by the Horai, see Shinra as their last hope for freedom. After nursing him back to health, they give him a ship named after their village, and send him off to destroy the Horai. The story takes a back seat to the gameplay, which is a shame, as the character designs are so cool and unique, it would've been neat to see them interact somehow. 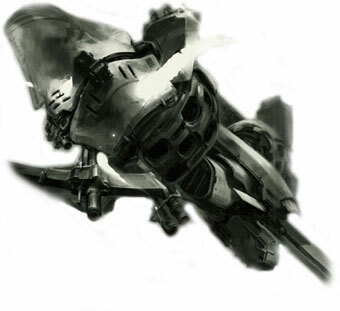 The kanji for Ikaruga mean "mottled dove", which probably refers the dual colored nature of the ship Shinra pilots. Every enemy ship in the game comes in two polarities: light and dark. The Ikaruga can switch between light and dark polarities at will. Firing white bullets at a white enemy does normal damage; shooting white bullets at a black enemy does double damage, and the same is true for the reverse. Changing polarity is not only offensive, but defensive as well: the Ikaruga can absorb bullets of the same polarity, and store the energy to be released as a powerful homing laser attack later. Attacking an enemy with the same color also has an effect: when an enemy is destroyed with bullets of the same polarity, it lets out a flurry of shots of the same color. Deciding when to kill quickly and when to slow down to charge up the homing attack is integral to the attack strategy of the game. If that weren't enough, Treasure also added a combo system, which is the only way to rack up high scores. It's as simple as destroying ships of the same color in chains of three. This starts out easy to do, when enemy fighters fly in formations of the same color, but quickly becomes difficult when they mingle together. The first chapter introduces the game's concepts at a brisk, but managable pace. After the formal introductions, the level design team takes off the kid gloves, and must have had a lot of fun doing it. The second stage has a great example of the brilliant, albeit maddening level design: a gauntlet composed of waves of bullets in both colors converge, requiring precise maneuvering as well as quick polarity changes, all while enemy fighters are firing away. It's hard enough to make it through in one piece, let alone chain effectively. It's these layers that make Ikaruga so brilliant. It starts with the base gameplay, then when the player becomes proficient, they can come back and learn new ways to complete the game to get the highest score. The goal of a high score may be a bit foreign to a generation of gamers that has been weened on games without any scores. Ikaruga may seem short to some, clocking in at a mere 5 stages, but don't expect to beat it the first time you play, or the second time, or any time soon, really. 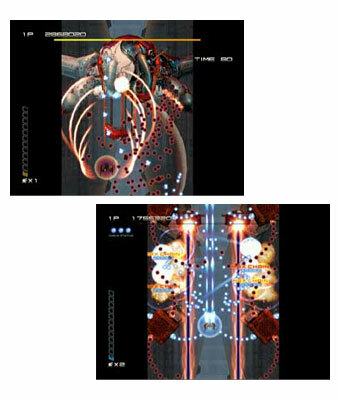 Learning patterns through repeat play is the backbone of any shooter, and it's more important than ever in Ikaruga. Once you factor in memorizing the patterns enough to chain perfect combos for the highest scores, it takes hours to master the game. A couple of demo and practice modes are included to help learn the patterns. However, watching a demo is a lot easier than playing the real thing. Of course, it's easy to finish the game once unlimited continues have been unlocked, but that's not the real end. The true test is the Challenge Mode, which lets you compete against every Ikaruga player on an international scoreboard at Atari's website. Ikaruga also makes an awesome cooperative 2-player game. The second player pilots a ship with the same abilities as the Ikaruga. A second player is always useful, two guns are better than one, but Ikaruga's special mechanics change that dynamic. On the helpful side, one player can shield the other from bullets, while the second player fires with opposite color bullets. On the competitive side, both players have to compete for chains. With the shooter genre being as refined as it is, a lot of the allure has to come from pretty graphics (or the not so pretty, yet extremely detailed space brains). Treasure not only incorporates impressive graphics into Ikaruga, but elements of style. Neutral backgrounds not only emphasize the clean black and white ships; they improve playability by making the ships and weapons fire pop out. The gameplay may be in two dimensions, but the backgrounds have a way of playing with the third dimension in exciting ways. In the first chapter, the Ikaruga is deployed from its base ship. When it clears the launch bay, it flies towards the camera, pauses to charge its engines, then charges towards the frontline to take on an entire armada of warships. This is the essence of shooters here, delivered with such pinache and artistry. The light and dark dichotomy is exploited to the extreme. Like yin and yang, Treasure has deftly balanced impulse with strategy with Ikaruga, elevating it beyond the run-of-the-mill shooters into the realm of must-play games for every gamer. Not every gamer will be able to handle the sensory overload, but every one should experience its genius at least once.